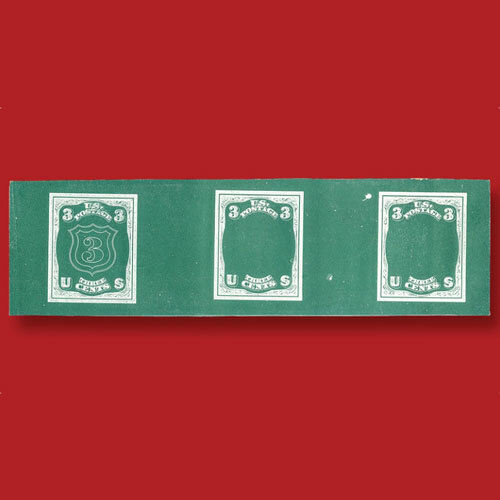 A wide range of interesting US, as well as world stamps, was offered by Cherrystone Philatelic Auctioneers on 6th and 7th February in New York City. One of the highlights was a scarce 1867 essay by National Bank Note Co. Its frame and lettering elements were similar to the then-current 3¢ Washington. By the end of that year, the stamp was reissued with an A grill. A simple shield outline with the number “3” at the center is featured on the first of the three designs in the essay. This special stamp was sold for $2,185, including a 15% hammer fee. A block of eight of the 1981 18¢ Space Achievement issue with blind horizontal perforations and imperforate vertically was sold for $2,645.